Showing items tagged with "email etiquette dos and don’ts" - 6 found. Is it rude to stop sending polite ‘thank you’ emails? 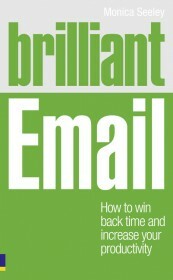 Instead is it good email etiquette and helping reduce email overload and improve business productivity? Click here to hear Dr Seeley’s interview with Ross Atkins on BBC World Service on ‘digital etiquette’. Last week it was the CBI report on the need to improve basic literacy skills which prompted my blog on the dire state of email etiquette. Simultaneously there was the excellent report ‘e-nough alre@dy from Grossman Group a leading American communications consultancy. It found that whilst email is perceived as a very effective communications tool many felt email communications needed improving. In particular email etiquette needed attention. The break down is shown below. Over dependence on email when an alternative would be better (eg phone). This looks just like the list of challenges which we hear when running workshops and asking the question ‘what annoys you about email‘. Are these results surprising when so few people have ever been trained to use email properly? What ever happened to all those workshops on letter writing which many of us who belong to Generation X had to attend? Whilst many of us were used to writing social letters, once we started work it was off to learn about the principles of writing business letters. Email has now become the business letter of the 21st century. 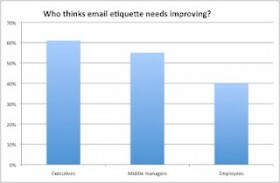 Yet why are so few organisations reluctant to run email etiquette courses? Those that do are often shutting the stable door after the horse has bolted: their organisation has become part of the latest media disaster or emails are being used as evidence in court. Poor email etiquette can be very costly. Please feel free to use the Mesmo Consultancy ‘Email Etiquette Checklist’ posted in an earlier blog. Alternatively we would be more than happy to come and talk about our Brilliant Email Etiquette master classes and how these can help you save time and money.